You can log on to a Linux server or VM running Linux OS using the Identity/Pubkey authentication method. The Identity/Pubkey authentication method helps protect against malicious applications like keyloggers, strengthens the security level and simplifies launch of automated tasks. Public key is stored on Linux servers to which you plan to connect from the backup server. The key is kept in a special authorized_keys file containing a list of public keys. Private key is stored on the client machine — backup server. The private key is protected with a passphrase. Even if the private key is intercepted, the eavesdropper will have to provide the passphrase to unlock the key and use it. For authentication on a Linux server, the client must prove that it has the private key matching the public key stored on the Linux server. To do this, the client generates a cryptogram using the private key and passes this cryptogram to the Linux server. If the client uses the "correct" private key for the cryptogram, the Linux server can easily decrypt the cryptogram with a matching public key. Veeam Backup & Replication does not support keys that are stored as binary data, for example, in a file of DER format. Generate a pair of keys using a key generation utility, for example, ssh-keygen. Place the public key on a Linux server. To do this, add the public key to the authorized_keys file in the .ssh/ directory in the home directory on the Linux server. Place the private key in some folder on the backup server or in a network shared folder. In Veeam Backup & Replication, from the main menu select Manage Credentials. Click Add > Linux private key. 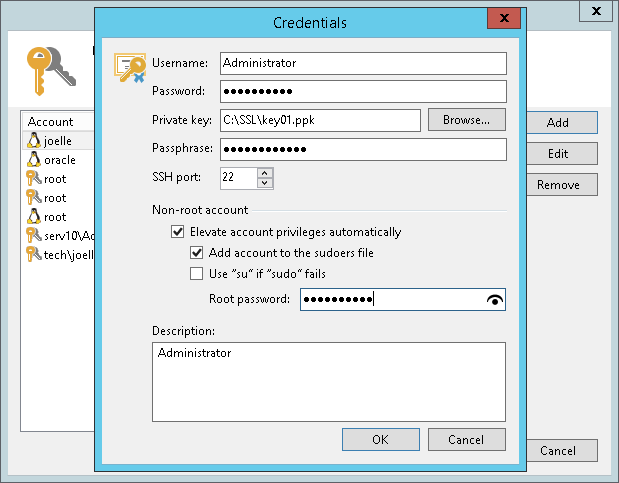 In the Username field, specify a user name for the created credentials record. In the Password field, specify the password for the user account. The password is required in all cases except when you use root or a user with enabled NOPASSWD:ALL setting in /etc/sudoers. In the Private key field, enter a path to the private key or click Browse to select a private key. In the Passphrase field, specify a passphrase for the private key on the backup server. To view the entered passphrase, click and hold the eye icon on the right of the field. In the SSH port field, specify a number of the SSH port that you plan to use to connect to a Linux server. By default, port 22 is used. In the Description field, enter a description for the created credentials record. As there can be a number of similar account names, for example, Root, it is recommended that you supply a meaningful unique description for the credentials record so that you can distinguish it in the list. The description is shown in brackets, following the user name.